Are there two pinholes in the matte board, or was Bushmiller that good? That's a great question, Nixie! 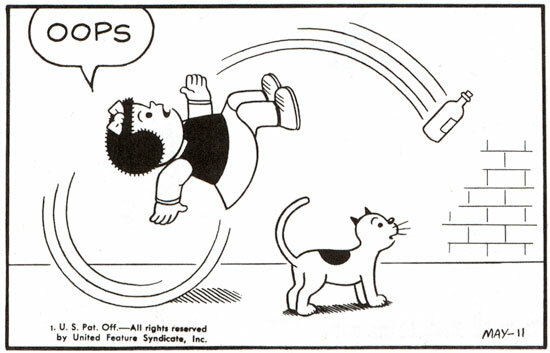 I have no idea; the Random Nancy Panels come from published sources, so they don't show things like that. I bet he used something like a can or a glass. Using a compass seems too "intellectual" for Bushmiller. It's so clean and clear! -The arch of Nancy's back follows the circle of the movement arc. -Nancy's chin and jaw line. -Nancy's hairline over her ears. -It looks like the ends of the movement arcs of the bottle follow another circle. Nothing left to chance, it seems.